They thought the war was over. They were wrong. Runacarendalur Caerthalien has been a master of battle for hundreds of years, but he found himself on the wrong side—the losing side—in the last war. Betrayed by his brother, trapped in a prophecy he does not understand, Runacar flees the battlefield. Yet Runacar is no coward. In a twist he could never have imagined, the Elven War-Prince finds himself leading a new army into battle—a force of centaurs, merfolk, gryphons, minotaurs, and talking bears who can perform magic. For centuries they have been trying to reclaim their lands from Elven invaders. With Runacar at the helm, they just might manage it. 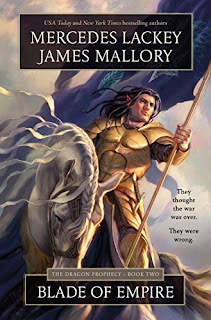 Mercedes Lackey and James Mallory’s first collaboration, the Obsidian Mountain trilogy, introduced readers to a brilliant, continent-spanning fantasy world of high adventure and epic battle. Civilization shimmered with magic while in the nooks and crannies of the world, dragons and unicorns hid from people who believed them to be nothing more than legends. The Dragon Prophecy, set thousands of years before that story, illuminates a time when long-lived Elves rule the Fortunate Lands. It is a time of dire prophecy, of battle and bloodshed, of great magics unlike any the Elvenkind have seen before. It is the story of the end of one world and the beginning of the next. The Obsidian Mountain Trilogy is a definite favorite of mine, and Lackey/Mallory make a great team, so this is a must-read for me. I haven't seen this one, but it sure sounds great! Nice pick. I've only read one Lackey book and I can't even remember the name - I know it was one of the few stand alones. Hope you love this! This sounds really good! Whenever I see Mercedes Lackey's name, my attention immediately perks up. I haven't read anything by her in too long. I am a big fan of her Valdemar series, in particular. Thank you for sharing! Hmm, I wonder if the Lackey/Mallory team plans on continuing their One Dozen Daughters series. My only experience with their work is the first book The House of the Four Winds and I really enjoyed it, would love to read more by them! Good choice and I love the cover. I also read The House of the Four Winds and enjoyed it so would echo Mogsy's comments.